Air Optix for Astigmatism contact lenses are the toric member of the Air Optix family of contact lenses by Alcon (formerly CibaVision). Astigmatism correcting contact lenses are specially designed to stay in a stable orientation because it makes a difference in visual acuity if the lens rotates on the eye (this is different from a spherical lens which can rotate freely without compromising your vision). 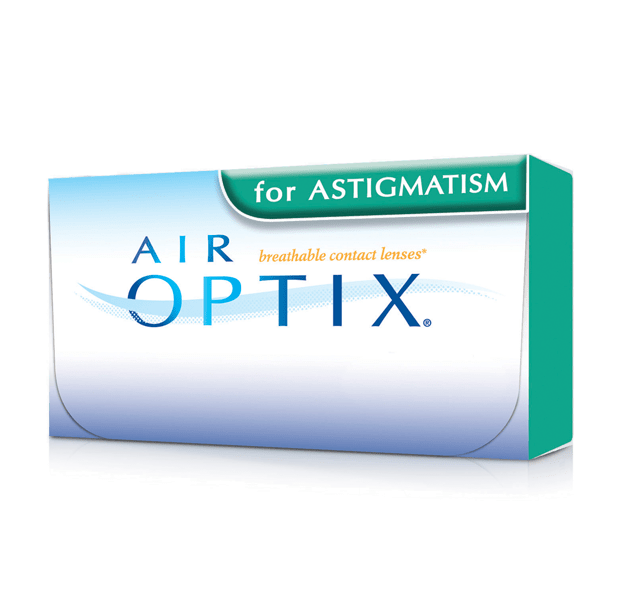 Air Optix for Astigmatism contact lenses are in the class of contacts known as the “silicon hydrogels.” By incorporating silicon into the lens matrix, the lenses of this group allow oxygen to more easily pass through the lens and reach the ocular surface. This is important because the cornea receives its oxygen supply primarily via the air, and a contact lens that restricts this flow of air can cause corneal problems including swelling of the cornea, changes in corneal cell make-up, and growth of new blood vessels into the cornea (which should be clear and free of blood vessels). You can purchase Air Optix for Astigmatism contact lenses from our office with just a phone call. If your last contact lens exam was with us, we’ll have your prescription on file for you, so there’ll be nothing you have to do other than give us a call and let us know how many boxes you’d like. If you pick your lenses up at our office then there’s no shipping charge, and it only takes a day, or sometimes two, for your lenses to arrive at our office. We can also ship your Air Optix for Astigmatism contact lenses directly to your home. Shipping is free on annual supplies shipped to your home. If it has been more than a year since your last contact lens exam, you will need a new eye exam and CL fitting or evaluation to ensure that Air Optix for Astigmatism contact lenses are still the best choice for your ocular health and vision. You can schedule your contact lens exam online or call our office with any questions.